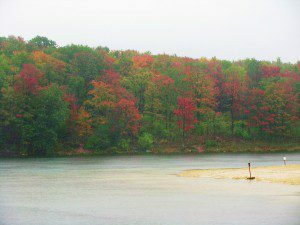 Brightly-hued maples color up the hillside on a rainy day at Parker Dam State Park. 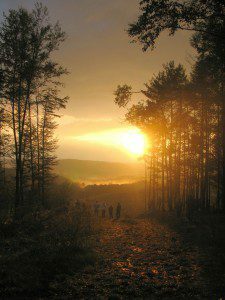 On September 27-29, Sheila Vincent and I led a DNS trip to the Pennsylvania Wilds, a swath of 2-million acres of protected forest and wilderness in the north-central part of the Keystone State. A great array of wildlife can be found here, plus spectacular scenery. The fall color looked great , despite the gray rainy weather when we arrived. Part of the large colony of White Birch at Marion Brooks Natural Area, the largest such stand in Pennsylvania. 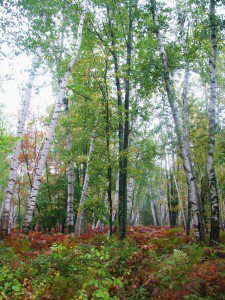 On our first venture into the Quehanna Wilderness, we visited the largest colony of White Birch known to exist in Pennsylvania. Primarily a northern species, these tree thrive in areas of disturbance. In fact, this section of wilderness is part of the vast Allegheny Plateau, created by the grinding of glaciers during the last Ice Age. The birches are part of the Marion Brooks Natural Area, a preserve that also features unique plants such as Cucumber Magnolia, Lady’s Slippers, and an array of ferns. A cluster of Redcoats or British Soldiers, a type of fruticose lichen. In the disturbed soil around a man-made pond, we encountered a tremendous concentration of Redcoats, a striking lichen. A lichen is the pairing of a fungus and algae in a mutualistic relationship. 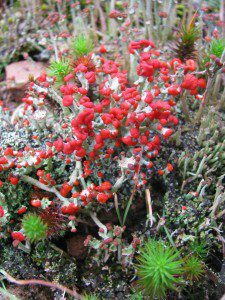 Most lichens are gray or dull green– few are as vivid as the Redcoat. A blooming Gall-of-the-Earth, also known as Tall Rattlesnake Root. 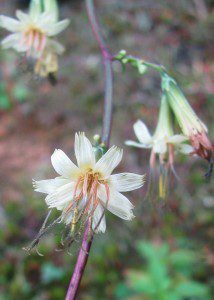 A mysterious wildflower drew our attention. With purple stems, asymetrical leaves, and straw-colored blossoms, the Gall-of-the-Earth is a distinctive member of the Aster family. There is disagreement as to the origin of the plant’s name. One camp holds that the drooping flowers look away from the sun, thus symbolizing the bitter descent of fall into winter. The other camp suggests that the bitter-tasting roots, used to treat dysentery and rattlesnake bite, gave the plant both its names. A paper wasp nest seemingly impaled on a hawthorn bush. For a bunch of naturalists exploring an unusual ecosystem, every discovery seemed noteworthy. 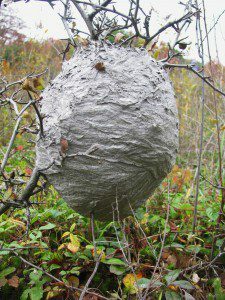 This bizarre paper wasp nest, built just a foot above the ground, had the extra protection of hawthorn spikes. An incredible sunset greeted us on our first evening in elk country. The elk grazed in the misty valley below while we watched. Awesome sunset picture, Derek. Wish I could see the herd of elk!